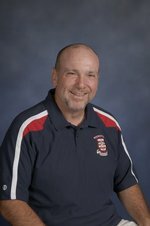 Blair Callaway is in his twenty-seventh year of teaching and his eleventh year as director of the Heritage High School "Legion of Generals." Blair is a 1982 graduate of Ringgold High School. He received his Masters of Arts Degree from the University of North Alabama in Florence, AL and his Bachelor of Science Degree from Jacksonville State University in Jacksonville, AL. His bands have received all superior ratings at district concert festivals and marching contests for the past 21 years. He marched with the Guardsmen, Cavaliers and Suncoast Sound Drum and Bugle Corps. Blair is a member of the National Association for Music Education, Georgia Music Educators Association, American School Band Directors Association, National Band Association, Georgia Association of Jazz Educators and the Epsilon Nu Chapter of Phi Mu Alpha Sinfonia. He is the 2018 Heritage High STAR Teacher, 2015 Heritage High School Teacher of the Year and is a member of Phi Beta Mu. He has received the NBA Citation of Excellence two times and his bands have received the GMEA Exemplary Performance Award three times. Blair is currently serving as Designated Past President of the American School Band Directors Association. He has been an instructor for the U.S. Army All American Band and performed with the Tara Winds at the 2015 Midwest Band and Orchestra Clinic. Blair is also a church organist at Grace Episcopal Church in Chattanooga, TN.